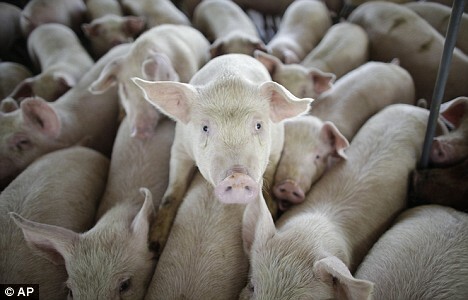 Barricaded with double-perimeter high-voltage electric and razor-wire fences and protected by security lights and locked gates, the ominous-looking compound in the high plains five hours east of Mexico City might be mistaken for a prison – except that the inmates are pigs. An unobtrusive sign announces that I have arrived at Site 8-2, a gigantic factory farm near the isolated hamlet of La Gloria where residents claim they are living at Ground Zero of the swine flu epidemic. The desert wind is rank with a nauseating stench. Eight hangar-style buildings house 7,200 sows and their piglets but the complex is eerily silent except for an occasional grunt. 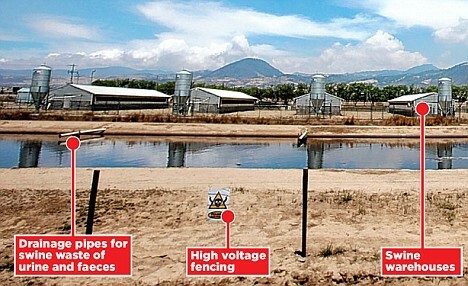 It is part of a chain of some 16 farms in this region that are owned by a Mexican company, Granjas Carroll de Mexico (GCM), in partnership with US-based Smithfield Foods, which, as the world’s largest pork producer, runs adverts in Britain about how it provides ‘good food in a responsible way’. Last month, however, after hundreds of La Gloria villagers complained of flu-like symptoms, a five-year-old boy in the hamlet, Edgar Hernandez, was confirmed to be suffering from the virulent new strain of swine flu, H1N1. Mexican officials are downplaying the epidemic, revising their estimate of deaths from the virus to 101 on Friday, a sharp drop from an earlier figure of 176, but the disease has taken a higher toll here than in any other country. 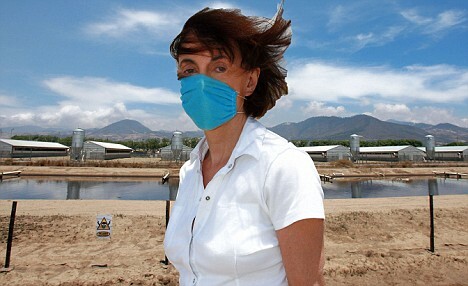 And activists in La Gloria claim the pig farms are a fetid crucible for the new virus. The company’s farming practices include burying dead pigs to rot in ‘biodigester’ containers. And pig urine and faeces are flushed into huge open-air pits, adjoining miles of cropland, which GCM disarmingly calls ‘lagoons’. Though environmentalists have criticised similar practices in the US, the La Gloria activists have not produced any scientific evidence of pollution in their little town (population 3,000). Indeed, when I requested a tour of the pig sheds, GCM’s director general, Victor Ochoa, politely refused, saying that it is people who are a threat to pigs and not the other way round. Some scientists sharply disagree, however. They argue that in damp, cramped conditions, swine viruses may mutate into contagious new strains. But Dr Michael Greger, director of public health and agriculture at the US Humane Society, said: ‘There is evidence that flies landing on animal waste can spread the flu virus for miles around. Sows at weaning farms such as Site 8-2 live with their piglets in cages so small that they have room to lie down but not turn around, a company spokesman said. They stand on grates over a water-filled pit. 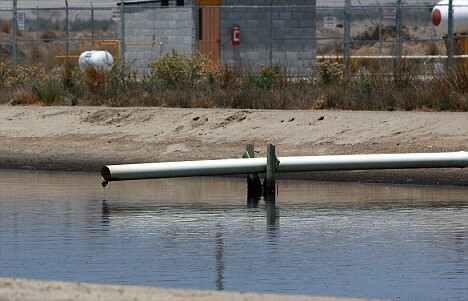 Once a week, the urine and manure is flushed into the lagoon, which has a clay lining that the company says prevents any seepage. Half a mile away, I found Site 8-3, where sows are transferred after their piglets are weaned. Here 16,200 of them were being fattened last week for slaughter. There are 18 sheds, connected in a similar arrangement to Site 8-2, to an outdoor cesspit. Behind the pit, there was another trench, the size perhaps of one-and-a-half football fields. Clouds of dirt, whipped by the wind, blew in my face and the smell was so overpowering I started to vomit. 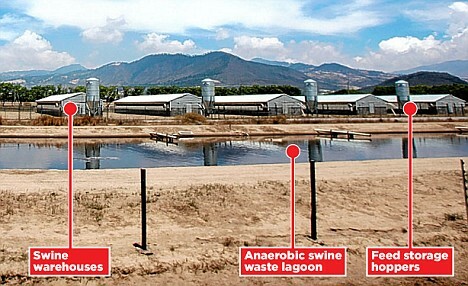 Ventilation pipes rose from a concrete slab, covering the ‘biodigester’ into which the dead pigs allegedly are dumped. A goatherd, Jose Benitez, who was tending his flock with his eight-year-old grandson on the track to the farm said: ‘When pigs get sick and die, they bury them there. I cannot handle the smell. Edgar Hernandez was among the La Gloria residents – over half the population, by some estimates – who began to suffer from sore throats, fevers and other flu-like conditions in an outbreak that began about three months ago. Mexican authorities say they took samples of mucus from 30 victims but only Edgar’s was positive for swine flu. They claim the remaining victims had common flu or pneumonia. And some villagers point out that illness and premature deaths are not uncommon in La Gloria because of their impoverished lives and lack of medical care. Despite the pork company’s claims that it has helped the local economy, its employees must meet a minimum requirement of the equivalent of A-levels and only a handful of people from La Gloria have obtained jobs at its farms. Most residents eke out a living from the stony soil, which they till with horse-drawn ploughs. Many get around in carts drawn by scrawny donkeys. A peasant called Maria said she has faith in the pork company. Standing outside her one-room hut, where she cooks on an open fire and sleeps on a mat, she said her seven-month-old son, Juan, had died suddenly after contracting a hacking cough. ‘The doctor said it was pneumonia,’ she said. She proudly showed me the pig she is raising in the rubble behind her shanty. ‘How can you catch flu from a pig?’ she asked nervously. But one of her neighbours, Estefan de la Cruz, blamed the pig farms for swarms of flies that he and other residents claim have infested the village. ‘We get lots of flies. The government sent trucks here yesterday to fumigate the village,’ he said. The company added in a statement that it follows ‘industry practices’ for animals that die from ‘stress or old age’. The bodies usually are disposed of in ‘biodigesters – a closed cement container that has a chimney. Substances like enzymes are added to accelerate biodegradation,’ the statement says. The company says carcasses are also used for compost. ‘This is not very pleasant to look at but it deals with a natural life cycle...properly and safely,’ the statement adds.